Prep. Time: 10 min. | Cooking Time: 5 min. A nutritious salad that is satisfying and delicious. The ingredients listed are for one serving, so double or triple and serve to your friends! Add a little water to the bottom of a frying pan (just enough to cover the bottom). Place the pan over high heat. The water will begin to boil quickly. Sprinkle a bit of sea salt into the pan. Stir in the carrot and onion. After a few minutes, add the greens and continue stirring until the water evaporates (should only take a few minutes). To mix the dressing, add two teaspoons of flax oil into a cup, sprinkle in some vinegar (to taste), add a pinch of salt and pepper. 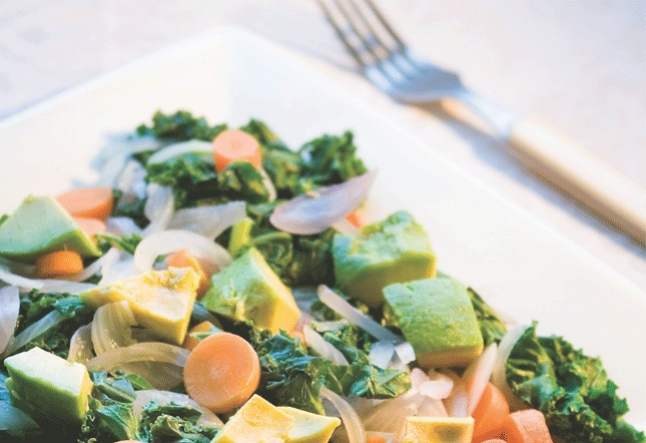 Place the cooked vegetables onto a plate and add the avocado and dressing. Make it your own by adding your favorite vegetables or cooked beans and grains on top!